In my travels I see some strange things from time to time, and Zzyzx Road is one of those. First, what's with the name? Second, many people seem to agree, as evident from the bullet holes in the sign. I am not a big Wikipedia fan, but for a road it will do. According to Wikipedia, Zzyzx Road is a 4.5-mile long, part paved and part dirt, rural collector road in the Mojave Desert. I guess the idea is the word is the final one in the English dictionary.Anyway a picture seemed to be in order, and I think it says it all. 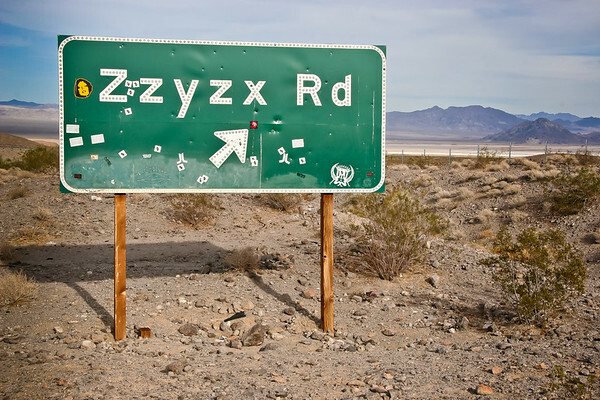 The Zzyzx Road sign is in southern California. [mapsmarker marker="37"] Even road signs can make an interesting picture!